If you had told Haley Linder when she was a freshman at MU that she would one day be crowned a rodeo queen and aspire to work as a dairy cattle nutritionist, she would have been confused on how she ended up there. Growing up 45 minutes northwest of Chicago, Linder didn’t come from an agricultural background. She did, however, grow up riding horses, and wanted to attend veterinary school. After Linder received a scholarship and was pre-accepted into the veterinarian program as a high school senior, Mizzou was an easy decision. “When I came down here and stepped foot on the quad, I knew instantly that this is where I was going to go to school,” Linder said. Haley Linder, the 2019 Miss Ozark Rodeo Association. Photo by Rockin Rodeo Creations. Linder started as a biology student at MU and switched her major to animal sciences after her sophomore year. A friend later introduced Linder to Dairy Club. She became interested in the dairy industry and completely changed her career path. Now, Linder is a master’s student at MU studying animal sciences with an emphasis in nutrition and development in dairy calves. “I think it’s cool how my path has changed,” Linder said. Another friend of hers, who was the current Miss Ozark Rodeo Association Queen, invited Linder to attend her first rodeo. Being interested in all things equestrian, Linder agreed to go. After also falling in love with rodeo, Linder decided to enter the rodeo queen pageant. 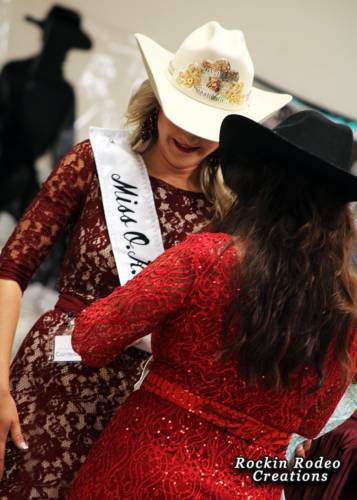 Before competing, Linder told her mom, Diane Linder, about rodeo queens and how she wanted to try for the title of Miss Ozark Rodeo Association, who serves as an ambassador for the association and for the sport of rodeo. Her mom asked her if she felt qualified for the position since she doesn’t participate in rodeo. That’s a question Linder has gotten used to – she believes her answer is what set her apart from her competitors. “I didn’t grow up in rodeo, but you don’t need to grow up in rodeo to love rodeo, to want to be a part of rodeo or to be a rodeo queen,” Linder said. This year was Linder’s second time competing in the Miss Ozark Rodeo Association pageant. Last year, Linder placed as first runner-up. 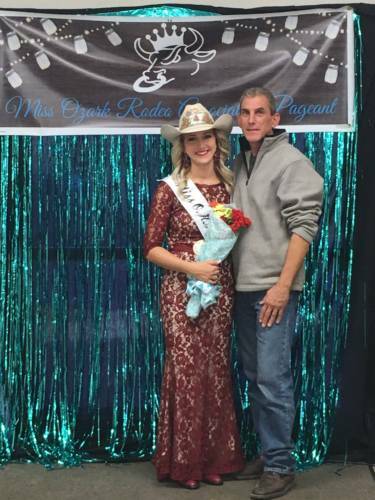 Haley Linder and her dad, Joe Linder, after being crowned Miss Ozark Rodeo Association. Photo courtesy of Haley Linder. There are four phases to the competition: a personal interview; a test over the association’s rulebook, rodeo knowledge and equine knowledge; a speech; and finally, a horsemanship phase. During the horsemanship competition, contestants were given a horse they had never ridden to complete a riding pattern. After riding the pattern, the contestants dismounted and were interviewed about horsemanship. Finally, they completed a queen’s run, where they run waving to the audience, and a flag run, where they carry a flag. Linder was crowned the 2019 Miss Ozark Rodeo Association on Oct. 20. As queen, Linder will attend all the association-held rodeos and carry the American flag during each rodeo’s grand entry. She will represent the association and introduce others to the sport of rodeo. She will be the first Miss Ozark Rodeo Association to compete at Miss Rodeo USA pageant.